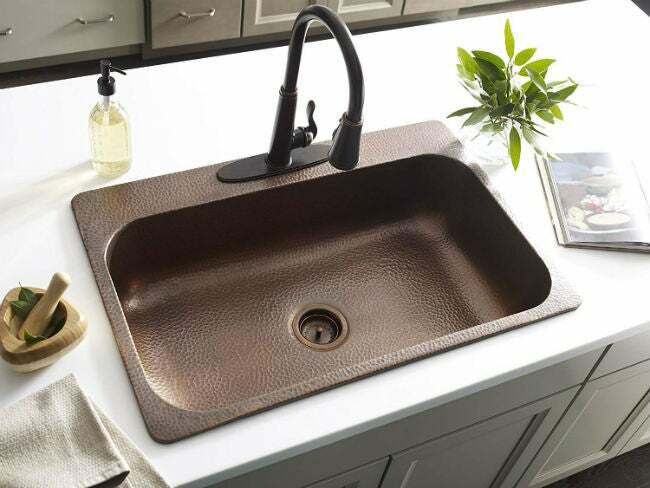 Stylish, Stain-Resistant, or Both: Which Type of Kitchen Sink Is Right for You? Study up on the pros and cons of these popular materials to get the perfect sink for your kitchen. If replacing a kitchen sink, you’ll think about style, size, and—perhaps most importantly—material. Some materials are highly durable and resistant to stains, scuffs, and scratches, while others are more delicate, better suited to light to medium use. 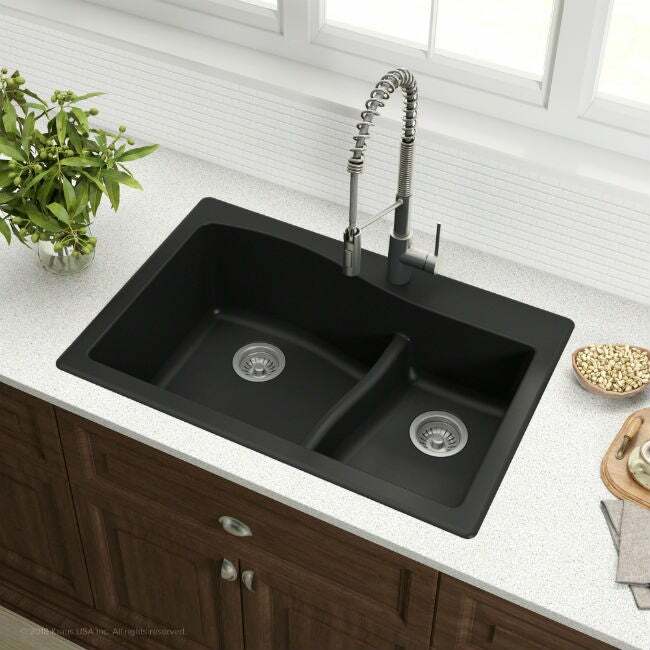 So read on for the strengths and potential drawbacks of seven best kitchen sink materials so you can make the right choice for your kitchen remodel. Stainless steel is the most popular material for modern kitchen sinks, providing a sleek, contemporary look, especially when paired with granite, stone, or wood countertops. Undermount models lend a more elegant look than drop-in sinks. For a tough, sturdy sink, aim for 16 to 18 gauge (the measure of thickness) steel. Also check the series number, which pertains to how the steel was manufactured and whether or not it’s magnetic; 300 series stainless steel is not magnetic and so favored for structural products, like kitchen sinks. Plus, 300 series stainless contains both chromium and nickel to prevent corrosion and damage at high temperatures. A quality stainless steel sink ranges in price from about $110 to $850 (including faucet fixtures). 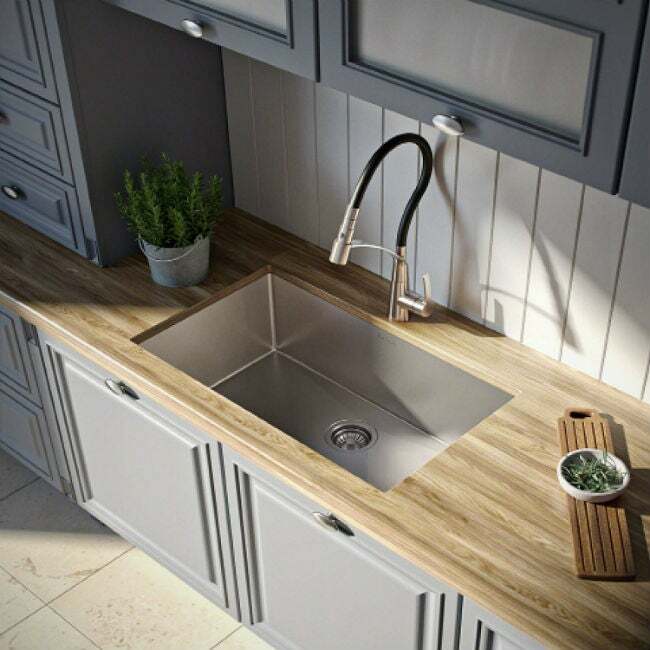 Read more on Amazon about the top-rated stainless steel sink pictured above: Kraus Standart PRO Series Undermount Stainless Steel Sink. A bright, warm, rosy-colored copper sink will be a kitchen’s focal point, attractive as a standard undermount or drop-in model as well as farmhouse style. You can also choose between a smooth or hammered finish and a range of patinas. Copper also boasts the natural ability to kill 99.9 percent of bacteria. 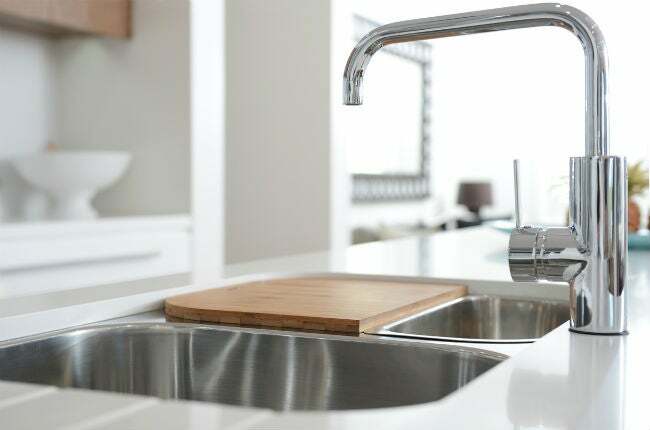 Scientists have found that copper molecules “punch holes” into bacteria membranes, inhibiting their metabolisms and halting growth—an asset that makes this one of the best kitchen sink materials when you consider that the cook space can be a breeding ground for germs. But a quality model that’s 99 percent copper and 1 percent zinc, that ranges between 14 and 18 gauge, will be pricey—starting at around $600 and going up to $1,200 depending on size, style, and brand. Be wary of lower-priced copper kitchen sinks that may contain thinner gauge metal, which damages more easily. Read more on Amazon about the top-rated copper sink pictured above: Sinkology Angelico Drop-In Copper Sink. This old-fashioned, timeless kitchen sink is constructed of cast iron with a glass-based glaze, available in a variety of colors. Enamel has a softer, quieter look and feel than stainless steel, and its style can also increase home value—if it’s well maintained. Enamel sinks are heavy and need the support of reinforced countertops and cabinetry. They are also prone to staining and chipping, so use non-abrasive sponges to avoid surface scratches and a mild acid like vinegar to treat stains. If damaged, the enamel surface can be refinished with a DIY kit or by a professional. While new enamel sinks run between $300 and $600, a savvy shopper can find a good-condition salvage or vintage model for about $200 to $300. Read more on Amazon about the top-rated enamel sink pictured above: Houzer Porcela Series Porcelain Enamel Undermount Sink. Fireclay is a type of enamel that’s molded from white clay fused with glaze and heated to very high temperatures. These kitchen sinks resemble traditional cast-iron enamel sinks yet are more resistant to staining and scratching. (Over time and depending on use, the finish may require re-glazing.) And like their old-fashioned counterparts, they’re heavy and need reinforced countertops and cabinetry to support them. Fireclay is most common in white and off-white shades, though dramatic black and blue fireclay are available. The most striking model is a deep, single-bowl farmhouse style. Each fireclay kitchen sink is handcrafted, one reason for their higher price—between about $570 and $1400, not including installation. And because there will be slight variations in size and shape, pro install is necessary. But if splurging on a fireclay sink, buy the best: Rohl, Blanco, and LaToscana are recommended brands. 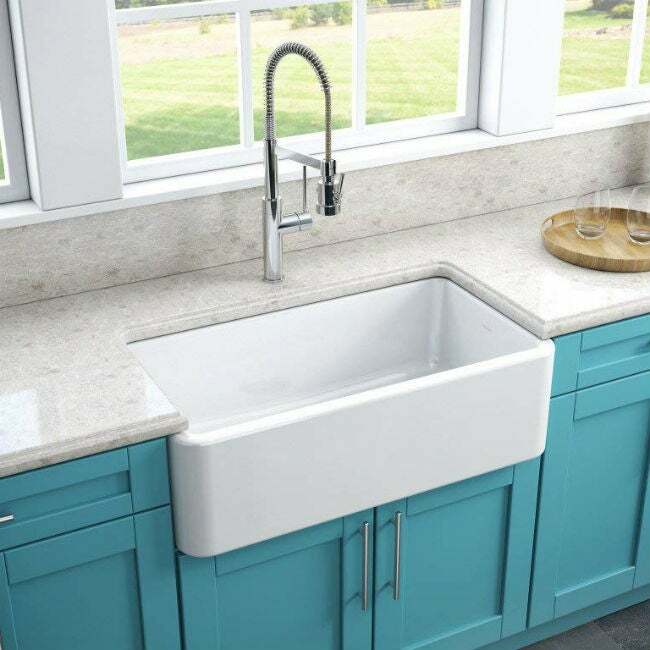 Read more on Amazon about the top-rated fireclay sink pictured above: LaToscana Fireclay Farmhouse Sink. This manmade acrylic resin that goes by various brand names, including Formica and Corian, is used for both countertops and kitchen sinks. It has the look of enamel without the high price or the heavy weight. Be wary of selecting the least expensive option in this category: Costlier versions contain better-quality acrylic resins retain their glossy finish and white tone despite daily use, while cheaper solid surface sinks may contain a calcium powder filler and appear dingy and yellowed within a year. Prices start at $155 for acrylic-based solid surface sinks. 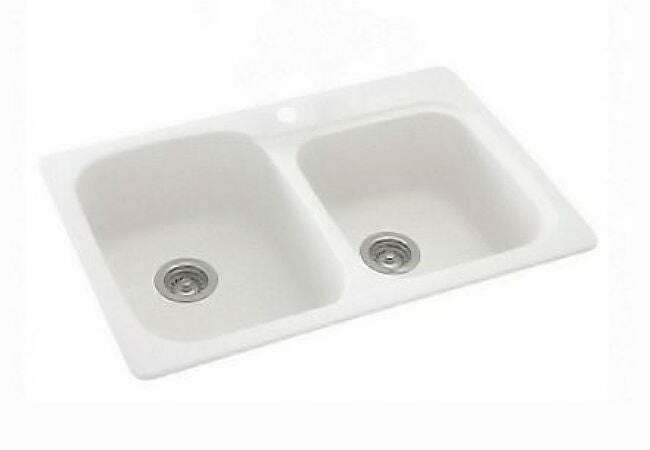 Read more on Amazon about the top-rated solid surface sink pictured above: Swanstone Double Bowl Kitchen Sink. Stone sinks—such as granite and marble (you can even find them made of petrified wood! )—bring a wow factor to the kitchen. Thanks to natural variegations and pigmentation, every stone sink is unique, and because they are carved from a single block, subtle variations in tone and texture are preserved. Stone, while durable, is also porous. Proper sealing is required to prevent scratching, staining, and damage from cleaning products and other chemicals. Stone sinks are also very heavy, requiring reinforced cabinetry. A pure quartz, marble, granite, or slate kitchen sink will cost at least $1000, not including installation. 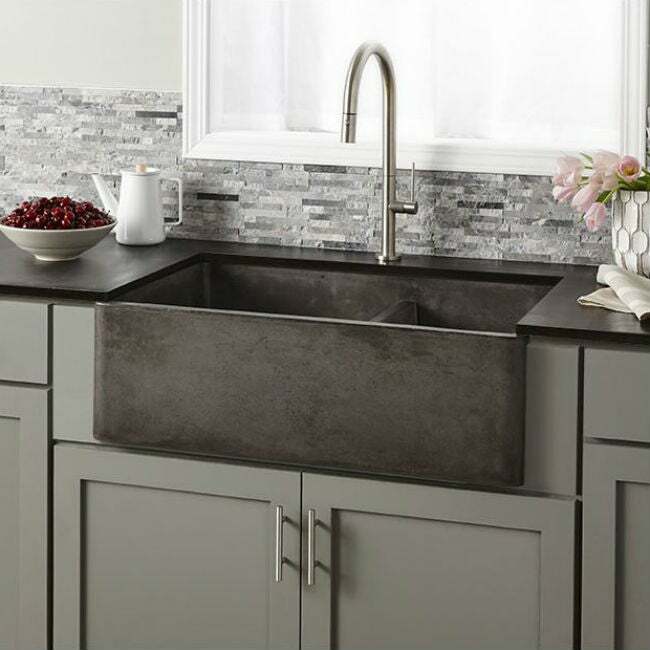 Read more on Amazon about the top-rated stone sink pictured above: Native Trails Slate Farmhouse Kitchen Sink. This blend of quartz dust and acrylic resins offers the appeal of stone for less—quality composite models go for between $200 to $400. Composite also provides a uniform look, which some people prefer to stone, and it comes in a wide spectrum of colors, sizes, shapes, and styles. Composite kitchen sinks are extremely durable and need no additional sealing. While it stands up to heavy-duty use, be mindful of exposure to extreme heat, which may crack or damage the surface. Read more on Amazon about the top-rated composite sink pictured above: Kraus Quarza Series Granite Kitchen Sink.